There are a number of ways to delete a roadmap's items. You can bulk-delete items in the Items Table. 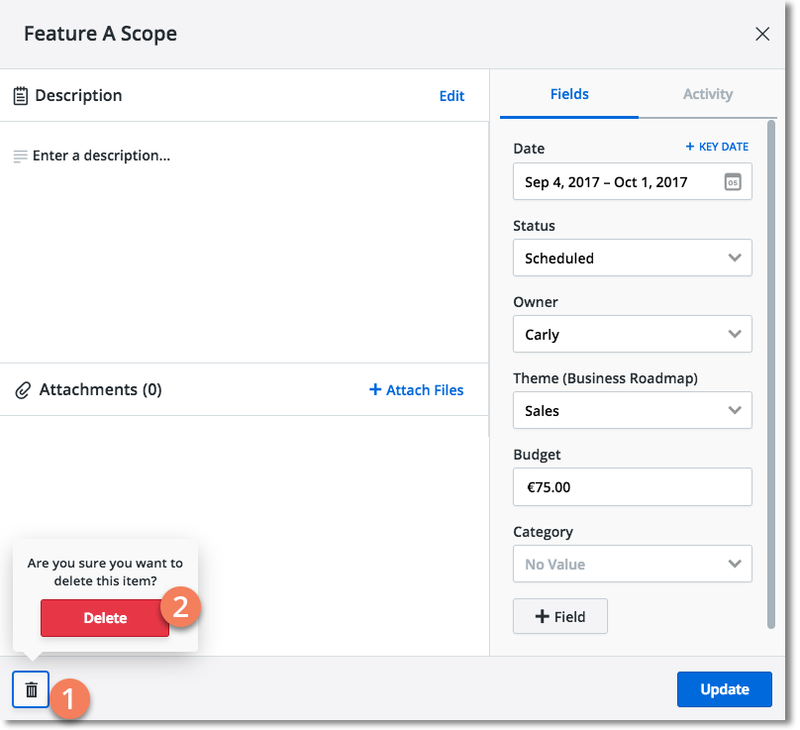 You can delete an item in a Timeline or Swimlane. And you can delete an item in the item card. IMPORTANT: Before deleting an item, please read the WARNING at the bottom of the article. You can bulk-delete items by selecting them in the Items Table. 1. Select the items in the table you want to delete. 2. Click the Delete button that appears on the View navbar. 3. Click the Delete button in the dropdown to confirm the deletion. 1. On the Timeline or Swimlane, right-click the item you want to delete, then click the Delete popup that appears. 2. In the Confirm Deletion dialog, click Delete it. Click the item's Description field. 1. In the item card, click the Delete item icon. 2. In the confirmation popup that appears, click Delete It. Who can delete roadmap items? To delete items in a Roadmunk roadmap you must be the roadmap's Owner or the roadmap must be shared with you as an Editor. If a roadmap has been shared with you as Viewer, you have view-only access. Deleting items from a roadmap deletes them from the Roadmunk account. You can't undo an item delete. Once you delete an item, it's gone forever.